Not a name traditionally associated with serious fare, director Adam McKay (‘Anchorman’, ‘Step Brothers’) changes his tune considerably for ‘The Big Short’, a harsh and smart, yet still witty film detailing the financial crisis through the 2007-2010 period, specifically focusing on the housing market. Assembling one of the year’s strongest ensembles – Christian Bale, Steve Carell, Ryan Gosling and Brad Pitt to name a few – the film serves up a complex topic, complete with an intensely complicated screenplay, and does its best to guide it so that even the most uninformed viewer can follow coherently. 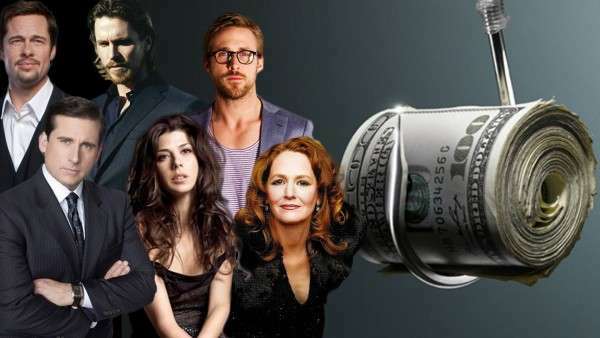 Despite the heavy-hitting quartet on hand, the cast seldom interact with one another with ‘The Big Short’ presenting its story from various perspectives; with Gosling’s arrogant Jared Vennett, a Deutsche Bank trader acting as our narrator. The plot itself is a little too complex to describe but the gist of it all sees the housing bubble on the verge of collapse, with a series of businessmen who had the foresight to see so diving further and further into financial waters. The film constantly breaks the fourth wall with an array of highly amusing cameos throughout doing their best to catch the audience up to speed, and despite the severity of the subject matter McKay has approached it with a dry wit that keeps the fast-paced story alive with surprising humour. As to be expected the performances are all top-tier with Carrell and Bale particular stand-outs – it’s easy to see why both have earned Golden Globe nominations – whilst Gosling surprises with a more comedic turn, leaving Pitt little more than a glorified cameo. Scathingly funny, highly entertaining and wonderfully complex, ‘The Big Short’ thankfully never appears too smart for its own good as it reminds us of a devastating moment in time whose blow is softened, but never diminished, by this seriously sly production.